Mount Vinson is the highest peak in Antarctica lying within the Ellsworth mountain range a mere 600 miles from the South Pole. The icy continent is a landscape of extremes, with night-time low temperatures often reaching negative 40F and a summertime sun that never sets. Antarctica is one of the last truly wild places on earth, and climbers who venture to “The Ice” will leave with a feeling that they were just part of something very, very special. Our Mount Vinson Antarctica climbing team meets at the southern tip of Chile in the bustling port town of Punta Arenas. We will spend two days checking equipment and weighing our collective gear and supplies in preparation for the 6 hour flight to The Ice. 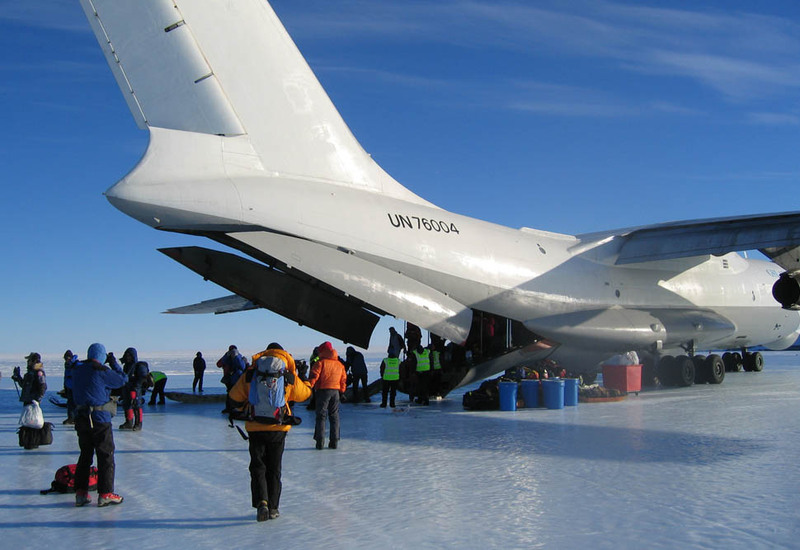 Flying to Antarctica aboard a Russian Ilyushin IL-76 cargo jet and landing on the blue ice runway at Union Glacier is an experience you will never forget. From the Union Glacier we board a Twin Otter on skis for the flight to Vinson Base Camp. It takes an impressive amount of logistical support to get people and gear to the bottom of the world. 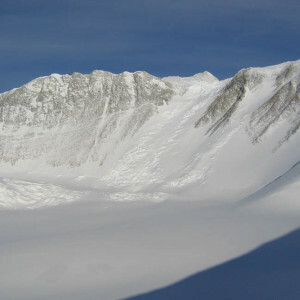 The guided expedition up Mount Vinson involves glacier travel and moderately steep snow climbing. 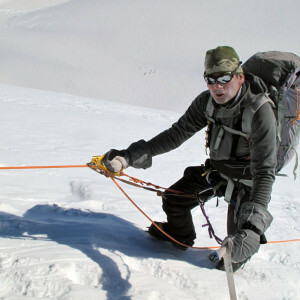 We generally put in two camps above base camp before going for the top. The summit ridge provides some interesting climbing as you wind through rocks, ice and snow on your way to the top of Antarctica. The views from the summit on a clear day are breathtaking, as you gaze across an ocean of ice which extends all the way to the horizon. 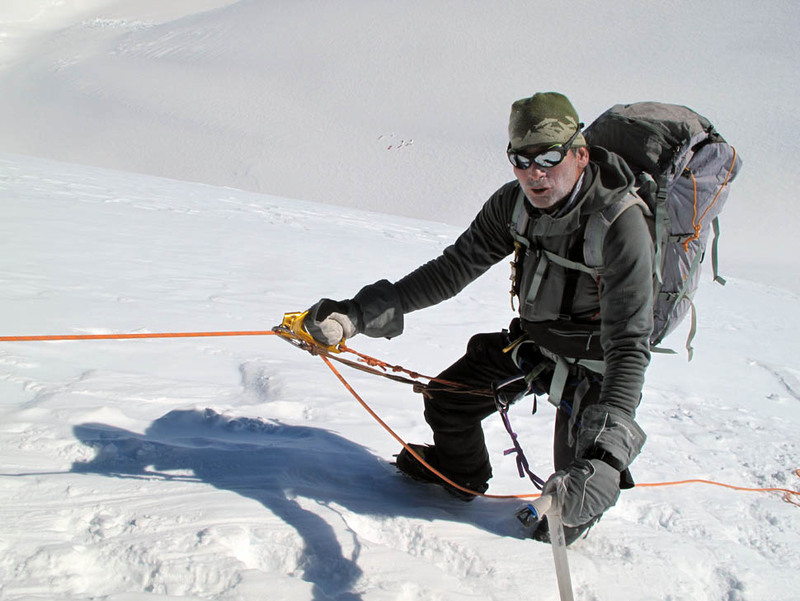 Vinson climbers should prepare themselves physically to be able to carry moderately heavy loads over the course of 6-8 hour days. Antarctica is a very cold place and proper equipment is essential. 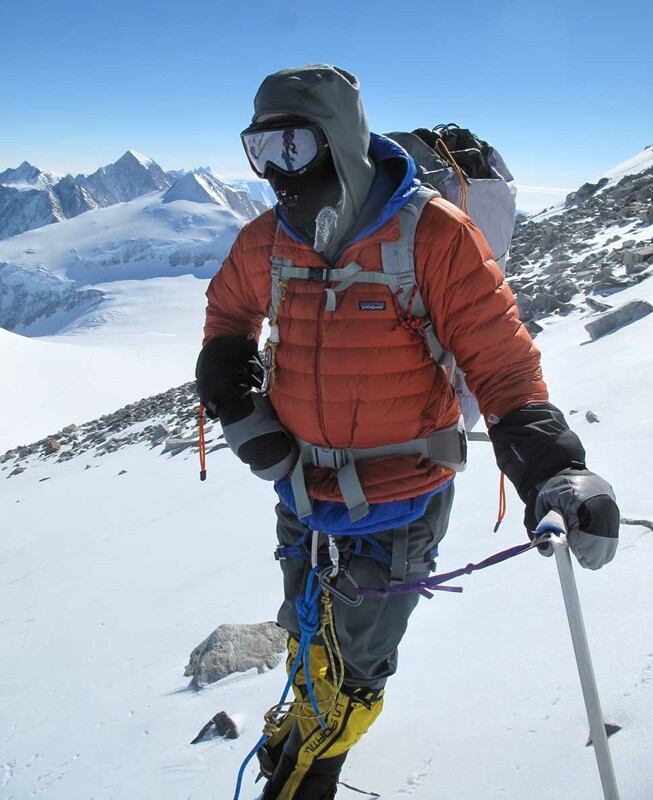 Our Mount Vinson expedition guides are very adept in taking care of climbers in Arctic and Antarctic conditions; however, climbers must ultimately be familiar with how to look after themselves in a very cold environment. 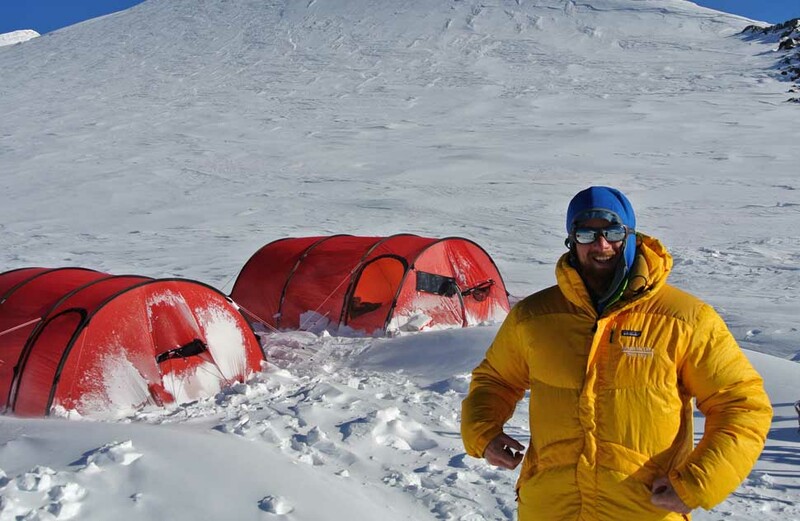 Our expedition guides are very experienced with the rigors of Antarctic climbing and we provide them with the very best in food and supplies to ensure that you have the greatest possible experience at every stage of your journey. 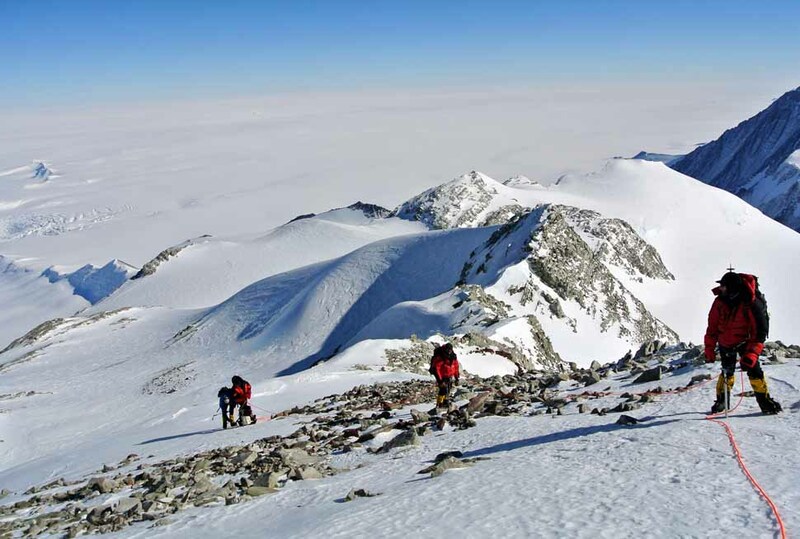 Mountain Trip sets the standard for quality on Mount Vinson. We use the finest Antarctic tents, and have been the only guide service to equip our Vinson Base Camp with a large comfortable dome tent for weathering out storm days. Vinson climbing expeditions take about 14 days; however, flight delays in Antarctica are quite common due to the ever changing weather. Mountain climbers must keep some flexibility in their return schedules to allow for delays. Based on booking trends over the past few years, and the limited availability of seats on the IL-76, we strongly encourage prospective climbers to book well in advance of their desired departure. Early booking also gives us priority for flights to Vinson base camp. Booking in April for a December expedition is good idea, if your dates are not flexible. DAY 1 ARRIVAL DAY IN PUNTA ARENAS. Team members should plan to arrive in Punta Arenas on this date. Depending on when everyone arrives, we might have our team meeting and equipment check at our hotel this afternoon. There are very few gear shops in P.A, so be sure that you brought everything on the equipment list and that everything is in good condition and of the highest quality. We’ll discuss the following days’ events in detail and probably still have some time to explore the interesting port city. That evening, we’ll all go out for a welcome dinner in one of the several great restaurants. DAY 2: TEAM MEETING OR CONTINGENCY DAY. We have seen enough delayed luggage on flights into Punta Arenas to have learned that it is worth arriving a day early for an expensive and time sensitive trip like this one. We often have time to go on a sightseeing tour on this day, but we might spend it doing gear checks and conducting our team meeting, depending on when team members arrive on the day before. DAY 3: GROUP MEETING. All climbers flying to Antarctica must attend a pre-flight orientation with ALE. 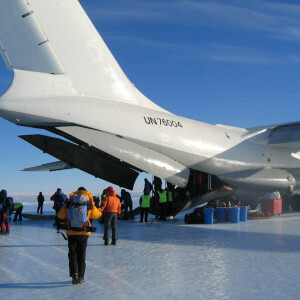 Later in the day we will weigh all of our equipment and food and ALE will stow it all on the Ilyushin. DAY 4: FLY TO THE ICE. Weather permitting, we make the 4.5 hour flight to the blue ice runway on the Union Glacier. From there, weather permitting, we will fly to base camp at 7,000 feet in a Twin Otter. 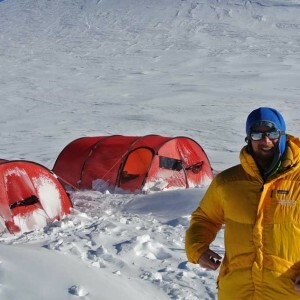 At base camp we will have an on-glacier safety talk and prepare our sleds with loads for our ascent. DAY 5: MOVING UP GLACIER. 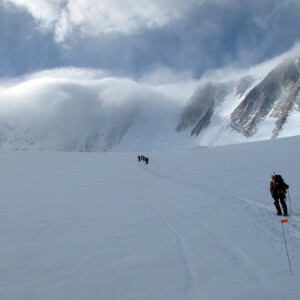 We have a couple of options as to where we can camp on the Branscomb Glacier. This decision as to which camp to use first will be based on weather conditions and on how the team is feeling on our first day on the trail. 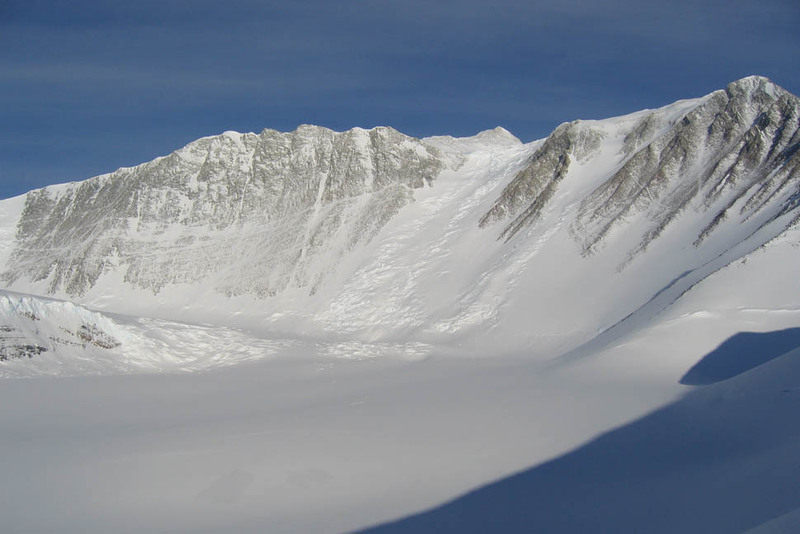 One camp is at the major bend in the glacier (about 9,600’) and the other is located at the base of the steep ridge and face leading to high camp at about 10,000 feet. For the sake of this itinerary, we’ll assume that we placed camp at the 10,000′ site. DAY 6: CARRY TO HIGH CAMP. We’ll carry loads up to high camp at 12,500 feet and return to Camp 1 for the night. This gives us a chance to “carry high and sleep low,” helping us stock the camp with supplies and enable our bodies to better acclimatize to the upper mountain. DAY 7: REST/ACCLIMATIZATION DAY. The day of carrying loads up the steep face is a long and tiring one, so most climbers will want to rest for a day before moving up to high camp on our summit bid. DAY 8: THE RIDGE TO HIGH CAMP. 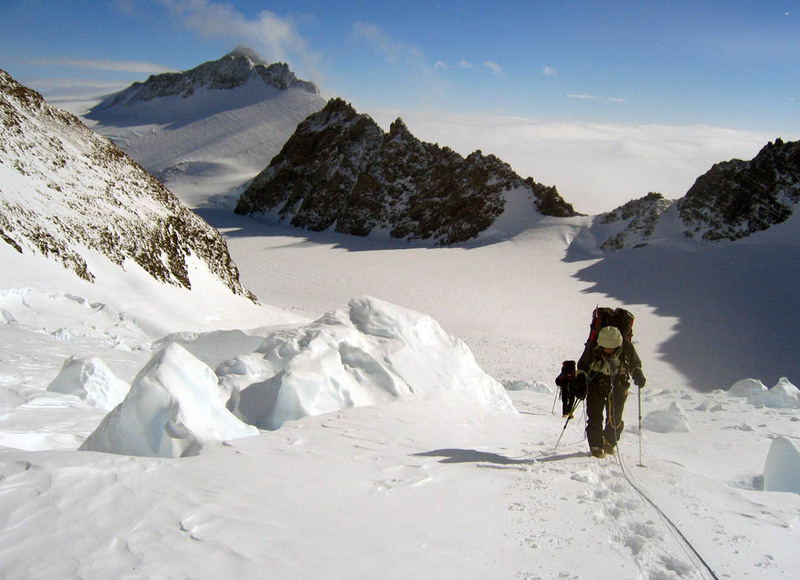 The route up to high camp climbs a steep face next to a rocky ridge for 3,000 feet (900m). The views back down the Branscomb Glacier can be astounding, so don’t forget to look back over your shoulder on your way up. This stretch follows fixed lines for most of its length, so be prepared to use an ascender with mittened hands. DAY 10: SUMMIT DAY! From high camp it is about a three mile traverse with 3,600 feet of elevation gain to the summit. 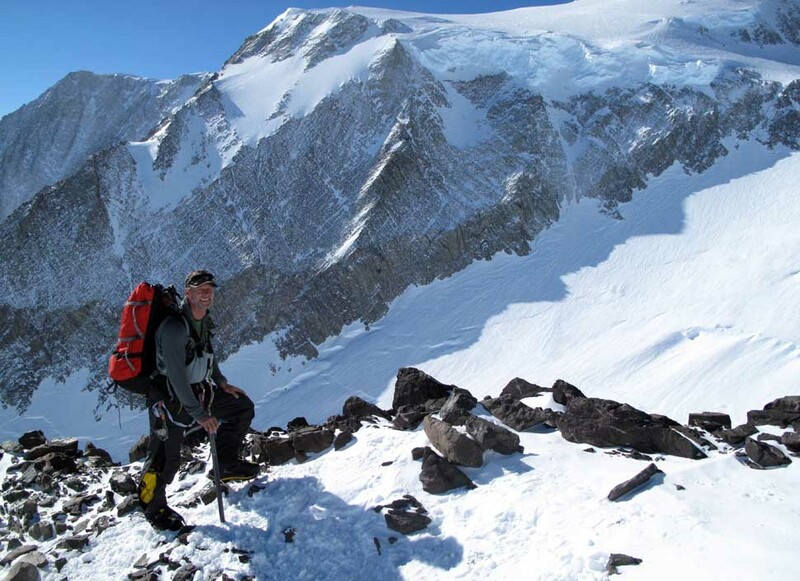 The summit ridge offers fun climbing with sensational views of Ellsworth Range and the Ronne Ice Shelf. After summiting, we’ll spend the night back at high camp before descending down the steep face the next day. DAY 11: RETURN TO BASE CAMP. DAY 12-13: CONTINGENCY DAYS. You’ve flown a long way and spent a lot of money to get here, these days are insurance so that you get the best possible shot at summiting. 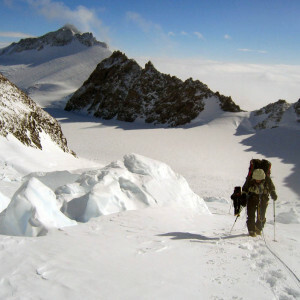 We’ll have plenty of delicious meals to keep us busy and the sledding and hiking out of Vinson base camp are fantastic. DAY 14: FLY FROM BASE CAMP TO THE UNION GLACIER / PUNTA ARENAS. DAY 15: FLY HOME This is quite optimistic, and climbers should heed our recommendations for booking return flights. ****This is a very rough outline of how the schedule might proceed. There are many options for moving, camping, rest days, etc. and we might easily be delayed by weather at the beginning, middle or end of the trip. Please keep an open mind and stay flexible! 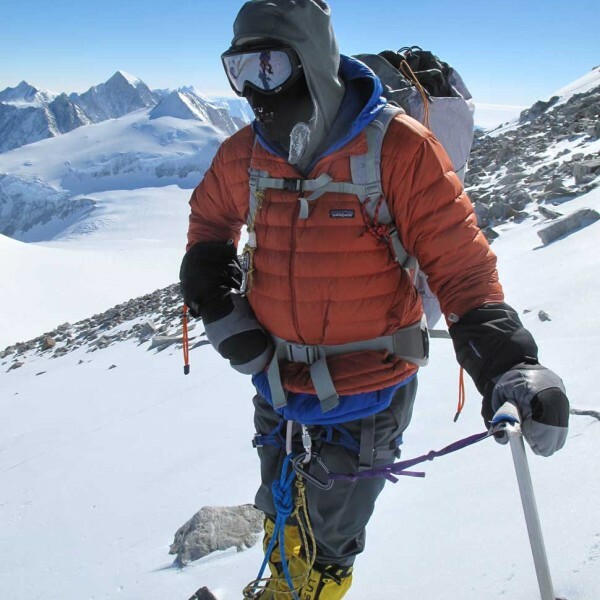 The following is a general list of required gear for climbing Mount Vinson with Mountain Trip. Climbers joining us on an expedition will receive an updated, comprehensive equipment list that may supersede this list. Many of the items on the list need to fit you well in order for you to fully enjoy your experience on the mountain. Please plan ahead with equipment purchased for your trip so you can be certain that your gear fits you well. The Branscomb Glacier is not the place to discover that your pack is too small for your torso, or that your boots give you blisters. Recommended items reflect the opinions of our guides. We have used and have faith in all of our recommendations, but they may not necessarily fit or work for you. Please follow this list closely and do not hesitate to call us for clarifications or to solicit an opinion about anything you are considering. There is a modest selection of gear available in Punta Arenas, but please plan ahead and do not plan on purchasing anything in Chile, as what you need just might not be available. Only bring down top-notch gear that is in very good condition, as it will all get tested, perhaps to the extreme! Overboots Double mountaineering boots require overboots for the potential extreme cold of the upper mountain. We prefer snug fitting neoprene overboots, such as the ones from 40 Below. Overboots are required for the La Sportiva Spantik and G2 SM boots, but not the Olympus Mons. Antarctica Sleeping Bag Only the warmest (- 40 degree) down sleeping bags are appropriate for camping in Antarctica. Synthetic filled bags warm enough for Antarctica are far too bulky and heavy, so goose down is really the only choice for a trip to the icy continent. [post_excerpt] => Double mountaineering boots require overboots for the potential extreme cold of the upper mountain. We prefer snug fitting neoprene overboots, such as the ones from 40 Below. Overboots are required for the La Sportiva Spantik and G2 SM boots, but not the Olympus Mons. [post_excerpt] => Only the warmest (- 40 degree) down sleeping bags are appropriate for camping in Antarctica. Synthetic filled bags warm enough for Antarctica are far too bulky and heavy, so goose down is really the only choice for a trip to the icy continent. 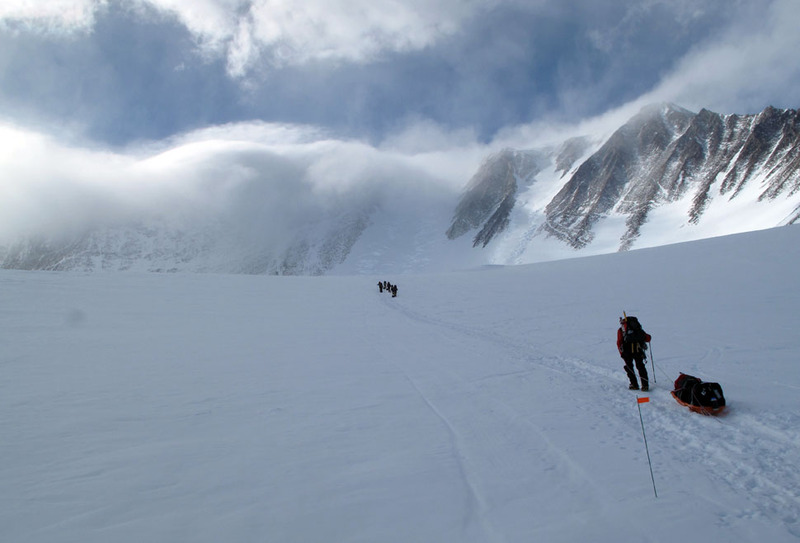 • Our Mount Vinson expeditions require a $7500 deposit to secure a spot on the team. Your submission of a deposit constitutes your acceptance of this Fee Schedule, Refund and Cancellation Policy. 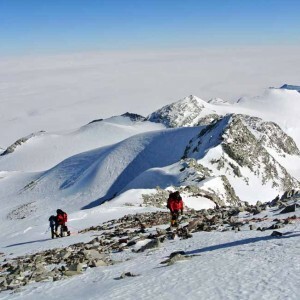 • All deposits for Mount Vinson expeditions include a non-refundable $1500 administration fee (Trip Cancellation Insurance is available to protect the administration fee, if not the entire cost of your climb – US and Canadian residents can contact Mountain Trip for information on such a policy). • Final payments for expeditions must be received 150 days prior to the Team Meeting Day. • Any cancellation 150+ days before your Meeting Day will be refunded in full, less the administration fee. • If you cancel 149-121 days before your Meeting Day, you are eligible for a refund of 50% of any monies paid, less the entire trip deposit. • No refunds will be provided for cancellations occurring within the last 120 days prior to an expedition. • If you register for a climb within 120 days of the Team Meeting Date, expedition fees will be due in full to secure your spot on the team. • Assistance arranging for post-climb activities such as penguin tours, Torres Del Paine excursions, etc. • Travel and/or rescue insurance – Please note that Medical Evacuation Insurance is required for trips to Antarctica. Use our office staff and your lead guide as pre-trip resources to ensure that all your questions are answered. 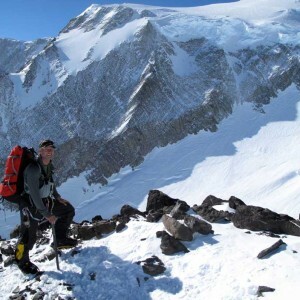 Travel insurance may help recoup expenses if you need to leave an expedition due to an illness and Medical Evacuation Insurance is required for this particular expedition.